Obviously this post will contain a pretty major Batman V Superman: Dawn Of Justice plot spoiler, so if you’d rather not know any details, now is the time to stop reading… okay? Okay. 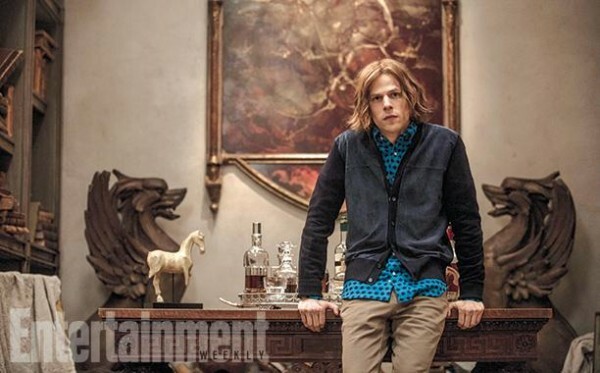 So, according to Heroic Hollywood, Jesse Eisenberg’s Lex Luthor is going to resort to some pretty reprehensible tactics in his efforts to get the Man of Steel’s attention in Zack Snyder’s upcoming movie. Superman can be hurt by Kryptonite as we all know (and we also see Lex about to get his mitts on some of that in the new trailer), but what makes him most vulnerable are the people he cares about, and at the top of that list is his dear ol’ Earth-mother, Martha Kent. It seems Lex is going to discover Supes’ secret identity at some point in the film and kidnap poor Martha, who will once again be played by Diane Lane. If Heroic Hollywood’s El Mayimbe knows what happens next he’s not telling, but it’s probably safe to assume that Luthor is going to incur the wrath of a very pissed off god-like being. There’s a shot in the trailer of Lex gloating over Superman, who seems unwilling or unable to do anything about it but glare at him angrily. I’m betting that’s because his mother’s life hangs in the balance. But that’s just pure speculation at this point, of course.